Casablanca Cafe: The picture of a belly dancing elderly woman says it all. During my nearly 3 decades on this earth, I have eaten in hundreds, probably thousands, of restaurants across Europe and America. Only once did I refuse to pay for my dinner (a revolting Mexican place in Sacramento that served us what looked like leftover catfood in a corn husk). This was 8 years ago, and for the first time in 8 years, I came close to refusing to pay for my food today at Casablanca Cafe in Bloomington, Indiana. Casablanca Cafe was playing music that brought to mind weeping Moroccan clowns when we entered (later it became better, and then there was no music at all). The menu had a few vaguely Moroccan items, and a lot more American Italian items. It reminded me, disturbingly enough, of an airplane food menu. New to this place, I asked the waiter for a recommendation (other than their $22 LUNCH specials). 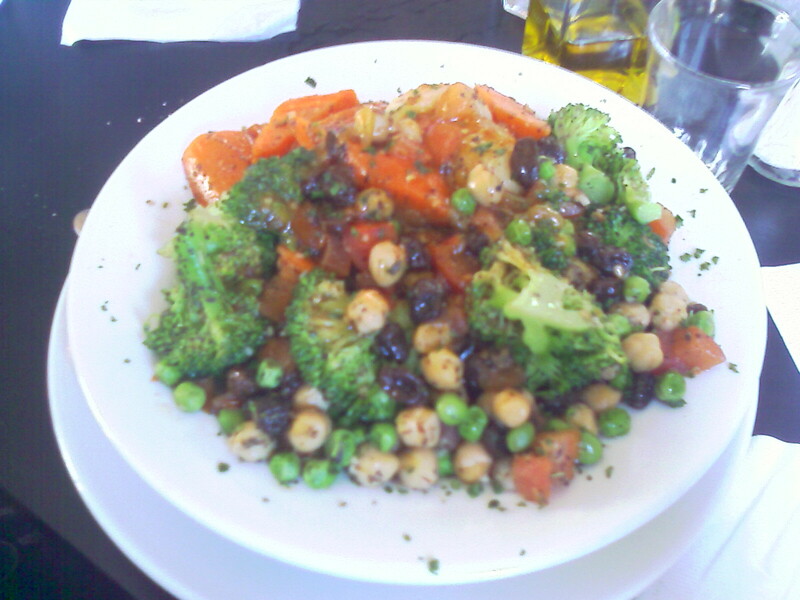 He advised me to try the couscous, rather than the gyros sandwich which also sounded good to me. 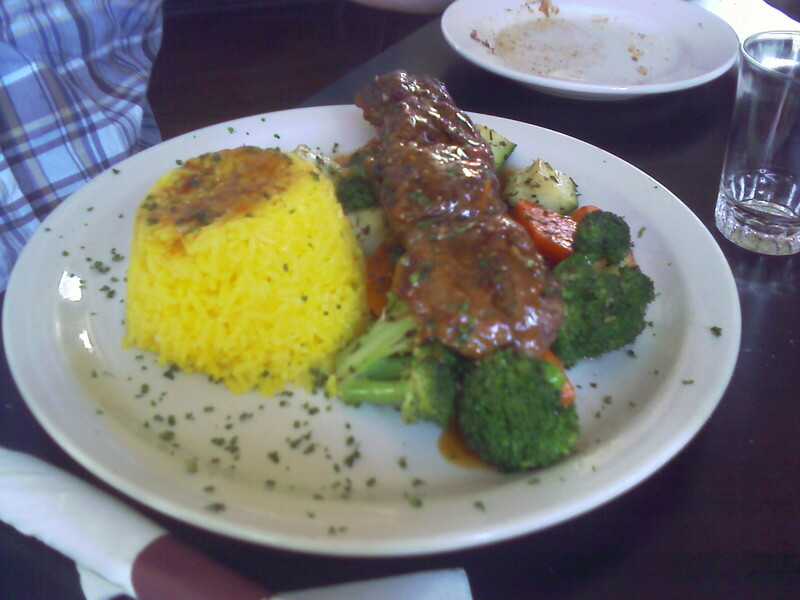 My husband ordered the lamb kabob with saffron rice and vegetables. The waiter brought out our drinks first, and I must admit that my “Michael’s Tea” was excellent, and seemed to contain homemade lemonade. My husband’s Moroccan green tea with mint on the other hand, at a very pricy $4.95, was so sickeningly sweet I couldn’t stand to drink it. (And I assure you I am not one of those people that thinks everything is too sweet) The bread, for which we had to pay extra (!! ), came with excessively cheap olive oil, and something they called “balsamic vinegar”, which we suspect was actually just cheap malt vinegar, as the only thing it had in common with Balsamico, was that it was vinegar, and it was black. The bread itself, contrary to what some other reviewers seem to have experienced, was neither fresh nor homemade probably. Casablanca Cafe Bloomington has the talent to make even lamb bland. I liberally sprinkled salt over my dish after the first few bites. Then again, and again, and again. This food was so bland, it even seemed to make negate the effects of salt, like a black hole of blandness sucking up and annihilating flavor. I finally decided this wasn’t worth sticking in my mouth and eating, so I left the rest of my dish. I can honestly say I have eaten better food on airplanes. Sure, just the thought of airplane food makes me want to vomit, but so does the thought of this bland, watery swill. Actually, vomiting this up and having lunch elsewhere sounds appealing, but I’m afraid our wallets are empty after paying for this crap. The final price for this slop? A whopping $40 (includes $5 tip) for two people, for lunch. No appetizers, no alcohol. Conclusion: My food left me wishing I’d ordered the Gyros sandwich after all. At The Trojan Horse bar.